Or perhaps the more accurate message would be, "sad to see the lack thereof." True, there are always individuals one would love, and those one would hate. Those that fit the description of "love to hate" first and foremost would be none other than the antagonists; the villains, the ne'er-do-wells. They're the obstacles that stand in the way of the protagonists' happy ever afters, the near unbreakable walls that stand tall and confident above the crowd. And in a series such as Kingdom Hearts, it is difficult to find anything better than the sheer thrill and satisfaction of being able to combat and (hopefully) defeat them with one's own hands. In this editorial, we analyze three key Disney antagonists whose worlds have been featured in the series thus far whether they have made an appearance or not. "Were you in love with her, Beast? Did you honestly think she'd want you, when she had someone like me?" Of course the first would be none other than Gaston. The words "no one gets shunned like Gaston!" have never rung any more true than they have now. 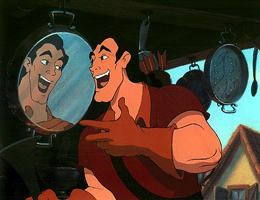 As the primary antagonist of Beauty and the Beast (1991), Gaston is the man everyone, or mostly everyone, likes. He's the most popular in the little provincial town, garnering the admiration of the men and the adoration of the women. He's the dream man, plain and simple. However, much to his dismay, Belle is utterly and completely uninterested in him and his advances. Needless to say, he's intent on getting her to marry him, even if by force. If anything, one of the most common criticisms of Kingdom Hearts II and Kingdom Hearts 358/2 Dayswas his absence. In order to tie in the world's plot with the overall story of the game, Organization XIII member Xaldin was inserted into Beast's Castle to ignite the flames of distrust and anger within Beast to turn him away from Belle and his servants to urge him to produce a powerful Heartless and Nobody. 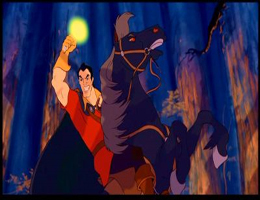 Once you think about it, if there's one person who can bring him to the brink of madness (in an insanity-sense), it'd be Gaston. 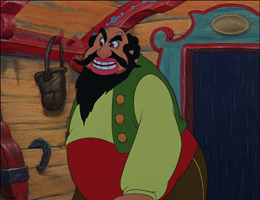 He who so desperately wants Belle for himself and would do anything to get her (admittedly in a shallow, material sense of possession) would no doubt be able to create a raging tempest within Beast's heart as the one who has grown to love and care for her because of who she is, and as a person. Gaston even admits it himself that he's not exactly the sharpest tool in the shed in the reprise of his namesake song, making it easy for him to fall prey to the promises of higher powers. He'd be able to make an quick deal with Xaldin for example; the promise of power which he can use to obtain Belle, and in exchange, he must play a part in the grand scheme to turn Beast into a Heartless. No doubt Gaston would instantly assault the castle with his newfound powers of darkness stemming from his negativity and army of Heartless. Not only will it all go according to plan, but it'd also stay true to the original story in the film, where he attacks the castle in command of a small army of villagers. And while the servants (and Sora's party as well) defend against the onslaught of the larger attack, Gaston would easily be able to sneak into the castle and target the Beast, or maybe even go straight for the prize and steal Belle away into the night. But knowing him, he'd prefer to go out with a bang! As he attacks Beast in an attempt to have Belle all for himself, Xaldin would be able to deal with Belle as he did in Kingdom Hearts II, while the able party is distracted with the small fry. From there, everyone would be able to connect together like links in a chain. Now that Gaston has what he wants, he'd call off the Heartless in overconfidence and direct the attention towards himself as he "deals the final blow." Seeing victory within reach, that'd draw Xaldin out of hiding with Belle and direct everyone's gaze towards the egoistic man. From there, well, let's leave it up to imagination. No point in taking all the fun out of dreaming up ideal scenarios. It is no secret to anyone familiar with certain key titles of the series that we have not always been granted such great pleasure. There have been moments where dramatic buildup have caused us to raise expectations to exceptional levels, only for a larger variation of the common enemy breed found throughout the title to stand in our way instead. In a single word, the reaction of the community can be simply summarized as "disappointed." 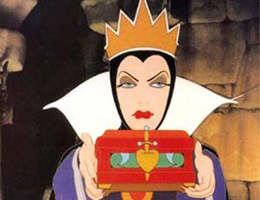 The Wicked Queen, hailing from Snow White and the Seven Dwarves (1937), the first animated feature film by Walt Disney. Originating from the German fairy tale by the Brother's Grimm, otherwise known as Queen Grimhilde is Snow White's stepmother, and high queen of the realm. Her beauty is known far throughout the land and she basks in her own glory through asking her precious Magic Mirror daily of the identity of the fairest in the land. Its answer has not changed ever, and upon hearing her name spoken by the man that lies within, her self-esteem grows all the larger, to the point where she cannot utterly fathom the thought of another being more beautiful than she. When the mirror speaks of a maiden with lips red as the rose, hair black as ebony and skin white as snow, she moves swiftly to deal with the obstruction to her perfect record at once. We obtained a chance to be in her royal presence in Kingdom Hearts Birth by Sleep. In accordance with the plot of the original film, she stays true to her vain and pompous self, dispatching Terra to do away with Snow White and bring back her heart in the role of the huntsman. She is well versed in the ancient crafts, well represented in the laboratory located in the castle dungeons that she uses to concoct malevolent potions and charms to bewitch even the strongest of all creatures. 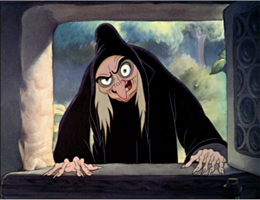 Ven encountered her on her way to present her poisoned apples to Snow White, transformed into her haggard and seemingly pleasant old lady form. By the time Aqua arrived, the dwarves state that she had escaped as they chased after her to avenge Snow White. "Escaped," in other words, we didn't get to fight her. I'm sure you're wondering, "well what exactly do you expect her to do?" That's simple. She could always walk the path of negativity and embrace the power within her heart to draw Unversed to her like Lady Tremaine in Castle of Dreams. Or if that's too mainstream, then there's always the more original option of her utilizing her talent in the mystic arts to transform herself into a monstrous creature or grant herself sorceress powers. Definitely does seem rather like Maleficent however, but beggars can't be choosers. Besides, in any case, you'd be able to exact vengeance for Snow White in place of the dwarves if she had some so. Trust the brilliant programmers over at Square Enix to exact a brilliant battle style for her had she been a combatant. At least personally, I find that rather satisfactory. If not, well I'm sure the graphics and visual effects will be stunning as always! "To me... you are belonging. We will tour the world. Paris... London... Monte Carlo... Constantinople!" As many of you are aware, Pinocchio's (1940) home world was set to appear in Kingdom Hearts 358/2 Days, but was cut due to size constraints. 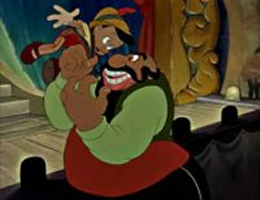 Within the files of the game, bust shots were discovered for Pinocchio as a real boy, Geppetto, Honest John and Gideon, and staff interviews in the Ultimania reported that the scenario was completed for the world itself as well. In the official Square Enix North American Members fan-based interview, director Tetsuya Nomura stated that Roxas and Xion would have travel to a circus based within the world where they would discover hope for themselves upon discovering camaraderie between the Nobodies such as themselves who don't possess hearts, and the puppet that lacks one as well. Based on that knowledge, it can be easily assumed that the greedy and vile Stromboliwould not have appeared. Now we've long since learned that the world will be debuting in Kingdom Hearts Dream Drop Distanceas Prankster's Paradise. We certainly see Pinocchio trapped in the cage Stromboli placed him in, yet there is absolutely no sign of the man, nor are there any other hints. At this stage, it might be best assumed that Sora, who is the only one to visit the parts of the world outside of Monstro, arrives after a considerable portion of the film to find Pinocchio already in this predicament, thereby removing the need for Stromboli's presence. Perhaps I'm wrong however. Now, Stromboli is a puppeteer, a showman. It's all about the stage to him, because in his eyes, the stage means money, and money makes for a very happy Stromboli. The film shows that when provoked, he can easily become cruel, vicious and absolutely brutal. He is definitely able and willing to put up a fight when the time calls for one. Albeit not very bright, his knowledge of puppets will no doubt prove useful in battle. If he opts for the more "traditional" method, he can easily make use of the various puppets he has at his disposal, and in all honesty, the likelihood that he may have rigged a few of them with tools and even weaponry is admittedly quite high. There can be stages within the battle where he leaps out of range of attack to send an array of puppets to fight in his place. Perhaps they'd be walking time bombs, or perhaps they can transform into larger mechanized beasts. The possibilities are large and whatever the imaginary scenario of a Stromboli battle may be, you can be it'd be interesting. Or he can utilize darkness and negativity, but considering his character, the making use of the puppeteer in him would probably be the best bet. Sad to say, even though we may never be able to see these individuals in battle, we always have the power of imagination to dream up ridiculous scenarios and battles with them. Or who knows? Perhaps someday they'll appear in the series in some form or another, and that's good enough.